These sugar bowls look great at the breakfast table and in your kitchen. The lid has a small cut out so that you can keep your sugar-spoon with your sugar bowl. Another great use for this piece is for storing honey. We suggest pairing this piece with a collection of our mugs, small plates and round butter dish for a beautiful breakfast table. The Wild Berry design has many yellow berries with a small brown centres. The vines and leaves are in two shades of blue, rich and vibrant cobalt, with a softer, pale blue accent. All our ceramics are hand made and hand painted by skilled artisans using ancient techniques here in the Algarve region of Southern Portugal. Red clay, earthenware pottery has been characteristic of the region ever since the Phoenicians, Greeks, Romans, and Moors traded along the Algarvian coast. It has always been favoured for its hard-working, durable qualities. It has a satisfying weight and a robustness that is distinctive in the hand. In most instances, the shapes we use have been handed down, from potter to potter, for thousands of years and you will often find identical shapes in history museums across Europe. 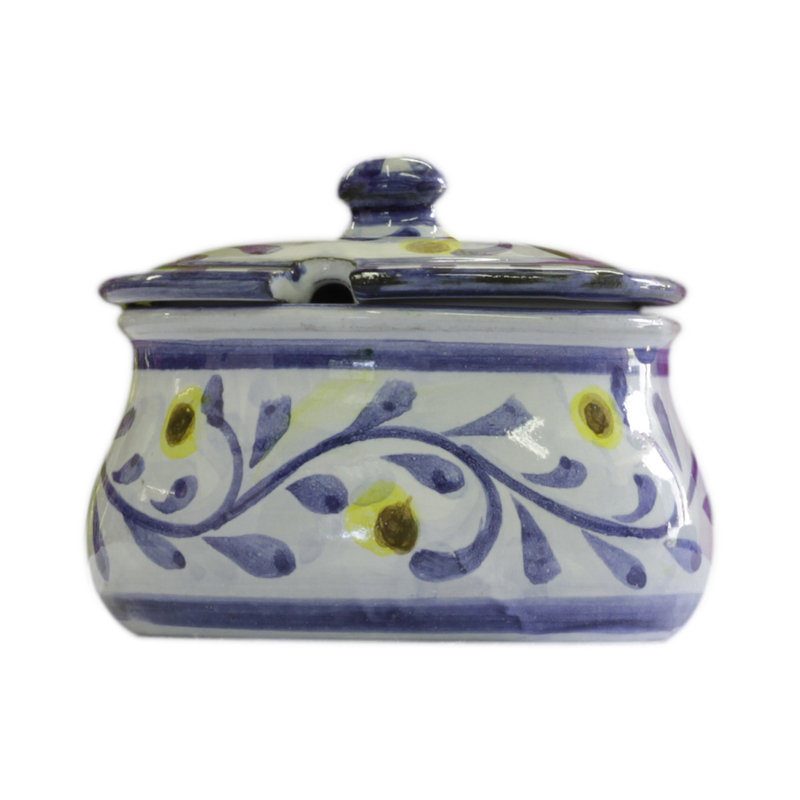 The pottery is hand glazed and kiln fired to temperatures of over 1000º Centigrade (or around 2000º Fahrenheit), which makes it completely food safe, and brings out the lustrous finish. We use the ancient Majolica technique to decorate our ceramics. This over glaze painting method demands free-flowing, confident brushwork, much like a fresco, and lends each piece with the distinct character of the artisan that has painted it. This means each and every piece is completely one-of-a-kind. This is why you will find the signature of the artist and the mark of the Pottery on the base of each piece, though the trained eye can identify the artist from their brushwork alone.